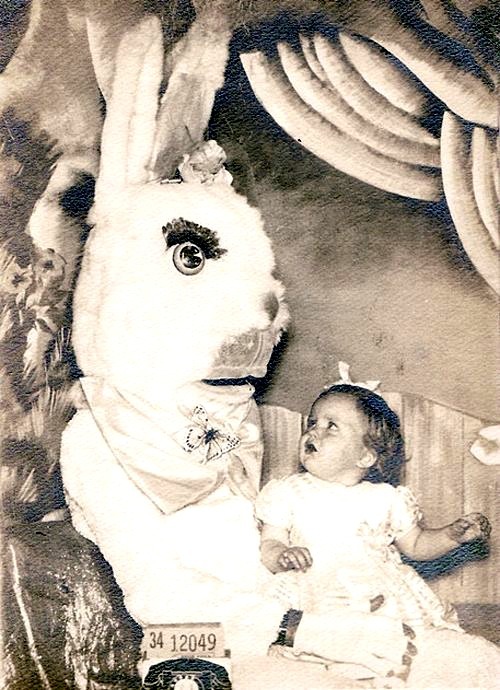 What does the Easter Bunny have to do with Easter, anyway? Easter is the Christian celebration of the resurrection of Jesus Christ, but chocolate eggs and the bunny who delivers them are not in the Bible. How did the Easter Bunny become popular in America? At history.com, there is an entry that says, According to some sources, the Easter bunny first arrived in America in the 1700s with German immigrants who settled in Pennsylvania and transported their tradition of an egg-laying hare called “Osterhase” or “Oschter Haws.” Their children made nests in which this creature could lay its colored eggs. 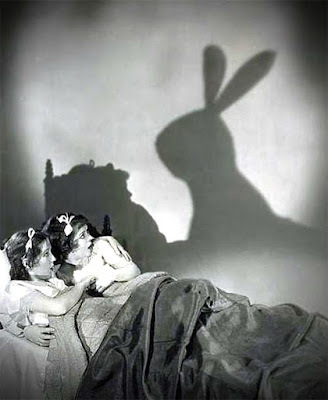 Eventually, the custom spread across the U.S. and the fabled rabbit’s Easter morning deliveries expanded to include chocolate and other types of candy and gifts, while decorated baskets replaced nests. 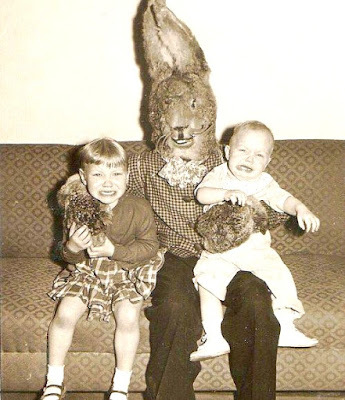 Additionally, children often left out carrots for the bunny in case he got hungry from all his hopping. 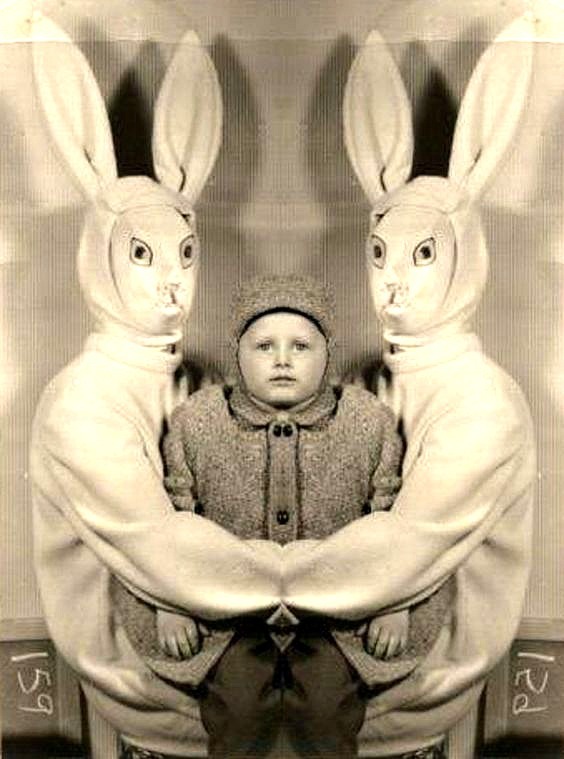 Easter bunnies are kinda' creepy, if you ask me! 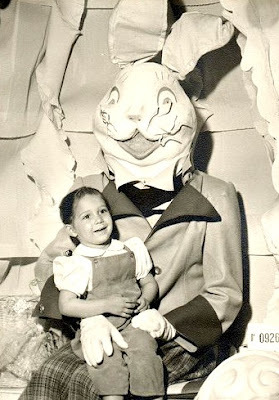 I searched online and found a few undated creepy Easter bunny photos for your viewing pleasure! We didn't really celebrate Easter in our family. I grew up in a predominantly Jewish neighborhood. Passover is our holiday. I do remember dying eggs though. It was more of a craft project during Easter vacation than a celebration of the holiday. 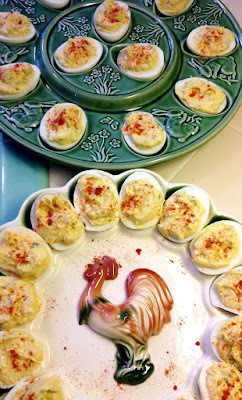 Later, we had deviled eggs. Happy Easter, my friends. I hope you have a grand celebration WITHOUT any creepy Easter bunnies!